" We live in a society of convenience, where throw-away products are the norm rather than the exception. But all of the disposable products take resources and energy to produce and then, of course, get thrown away, filling up our landfills. All of this is bad news for the environment." There are many easy ways you can make a change. Below is a list of suggestions, many of which we already do in our home. I've made little notes next to some of them sharing my thoughts. So what am I swearing to give up? Disposable coffee cups from Starbucks. Seriously, I work right upstairs from one, and often grab a drink on my lunch break. I have a reuseable mug in the office, but I never think to bring it down with me. Same goes with weekends when we stop by Dutch Brothers for an afternoon treat. We all have travel mugs (even Max) but I never bring them with me when I go to a coffee shop. Until now! I mean really- Ron has one of these and they stay hot for something like 5 hours! 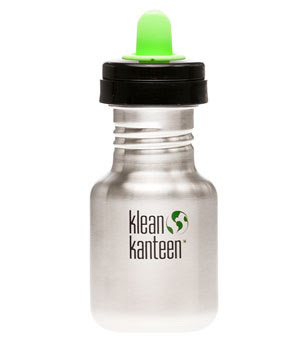 Disposable water bottles to (again) reusable bottles like Sigg or Camelbak **Again, we love these. For adults I like the Sigg better- perect size opening to drink from. 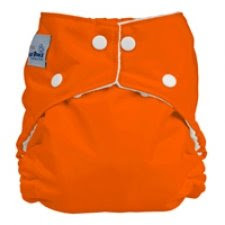 Disposable diapers to cloth diapers **I could go on about this forever- we love our cloth diapers! I do admit to having disposables around for travel and for when I get behind on laundry, but the cloth ones are much nicer. We love Fuzzi Bunz, but there are many options out there to choose from. 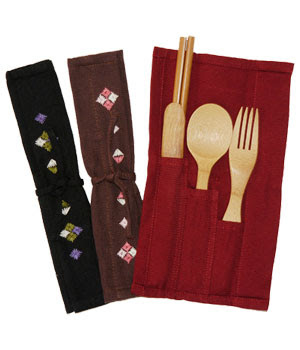 Disposable wipes to cloth wipes (inexpensive plain washcloths work really well). This is the best part of using cloth diapers, using cloth wipes! It's nice to have an extra thick barrier when you're cleaning poop. I make mine with one layer of soft flannel and one layer of terrycloth, then surge them together. Disposable feminine products (tampons, pads) to reusables like DivaCup, MoonCup, Glad Rags, Luna Pads, Pretty Pads, or New Moon Pads, among others **I made this change about 6 months ago and wish I'd done it sooner. I love love love the DivaCup. So easy and convenient. And for those of you who have tried those messy "Instead" things- it's nothing like those. And think of the money you'll save- $25 for a Diva Cup that lasts years. Grocery store bags to reusable bags I'm terrible at this. Oh, I have plenty of reuseable bags, I just forget to bring them with me. Working on it! I think I might get one that scrunches up really small like this and carry it in my bag. 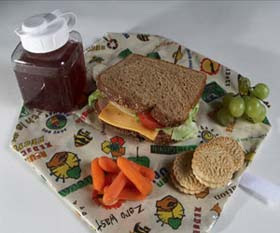 Paper lunch bags for Cloth Lunch Bags, Insulated lunch bags, Bento Boxes, or metal stacking tins. 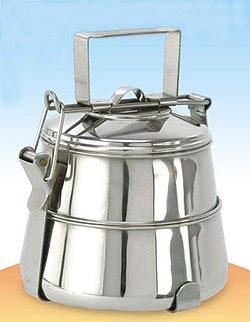 We have the metal stacking tins and LOVE them. And Max loves to take them apart and put them back together again. If you really want to go all out, I've heard these Mr. Bento Box's are awesome. Supposedly they keep your food piping hot (or cold) for hours. 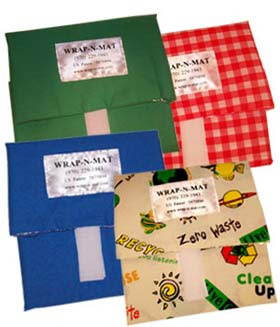 Plastic sandwich bags to Wrap-n-Mat. Again- we seriously love our Wrap-n-mats. I have a few, and the cool thing is that when you open them you have a built in placemat. Plastic disposable utensils for bamboo or metal ones. These bamboo sets are great. If you eat out a lot, or get takeout on the run,. why not carry a set of these in your bag? Has a napkin and everything. So there it is. Challenge yourself to make a change for 2 months, then see if you even want to go back! Or simply pick another item from the list in 2 months and take another challenge. Head over to Crunchy Domestic Goddess and tell her what you are ditching- she'll add you to the list of people and blogs who are taking on the challenge. ellie, this is a GREAT post. the lack of disposable food containers was one of the biggest differences i noticed in Luxembourg. If you wanted a coffee, you sat in the cafe and drank it. no Starbucks or something comparable. No 7-11 and super big gulps, only a few fast food restaurants (Mcdonalds and subway.) we are so wasteful it's alarming. The list you posted is very helpful. It's always reassuring to me to hear that even a small change in behavior can make an impact. Great post...I'm totally digging those nifty little utensil sets...how impressive it would look to whip those out of my purse! Great blog! I have been making a concerted effort to not use disposal silverware and cups at work for lunch. I have tons and tons of reusable plastic "picnic" silverware that I bought for my wedding shower (I told the hostess I didn't want disposals so I picked up the tab), and now I use them at work. I also don't use baggies because I have a few plastic sandwich containers to take to work. I really like those wrap-n-mats too though! Do you know what kind of fabric they're made out of? 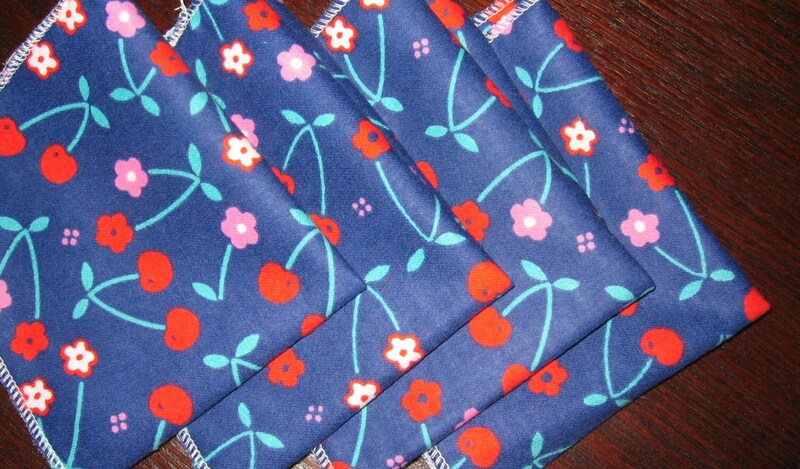 I think I might like to use up some of my fabric stash to make some of those! It's such a neat idea!